March Bead Journal Project – finished! Good morning! I have finally finished my March Bead Journal Project piece. I really enjoyed the bright colors and flowing pattern. 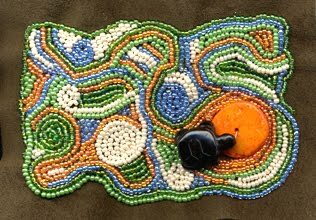 I still haven’t figured out how to sew down the big orange stone under the turtle – I’m certain there are instructions in one of the many books I have on beading, but I haven’t had time to flip through them to find out! Any tips are welcome. Carol, I just love the colors!! And the beading 'ain't bad' either!! HA Very, very nice piece! I love the gentle flow of your work, Carol. This is a beautiful piece! The photo doesn't get bigger when I click on it so I'm not sure how you have attached the stone. At any rate, the way I attach all things like this is with bead stacks as instructed in Robin's books. However, that has to be done before the surrounding beading, so I don't know if it's still an option for you with this stone. Others may have good alternative ideas. No matter, it's beautiful as is! Oh my, I just love the colors & especially the black turtle on the orange stone!!BRAVO!!! This is my new favorite color combination… I've never done any beading with this combination, but now, inspired by you, I want to try it! I love this piece, Carol… it makes me happy!About the stone… the way you attached it by sewing through the hole, over the top and into the fabric on the side works fine. Nothing wrong with the thread showing. In my March piece, which I'll post as soon as I get a picture taken, I've attached things exactly like this. Other things on the piece I attached using a beaded bezel. My book, Heart to Hands, tells how to do this eazy bezel by making bead stacks and joining the tops. Look for my post about my March piece… I'll write a bit about it and give a close-up picture. Thanks, everyone! I really appreciate your comments and am glad you are enjoying the piece. It was fun to see this emerge, both in color and shape.Robin and Barbara – thanks for the tips on bead stacking. I'll have to look that up as well as take a close look at Robin's post when it goes up. Carol, your March piece is so lovely! I like the bright colors! Hi Susan and thanks! I enjoyed doing this one. Thanks, too, for the suggestions of gluing and the bead stacks – I love the idea of leaving them as reeds around the stone for the turtle to relax in!